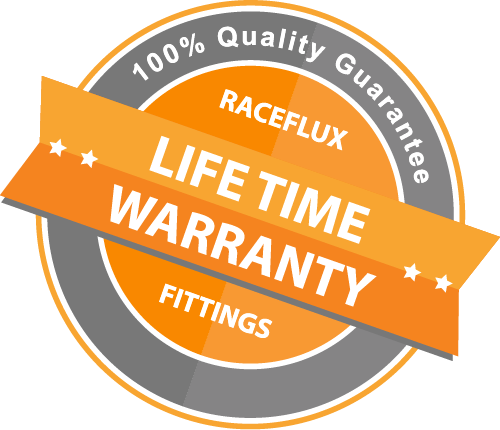 RaceFlux fittings are the only automotive application AN hose fittings backed by a lifetime warranty and quality guarantee. Should a RaceFlux fitting develop a leak or fail, you may return it for a free replacement subject to the conditions below. The Warranty covers fittings that leak or fail under normal use. Damage due to improper installation, neglect, or abuse, or the failure of other unrelated parts is not covered. The faulty fitting must be returned at customer's own expense. The replacement fitting will be shipped to customer at RaceFlux's expense. Proof of purchase may be required at RaceFlux’s sole discretion. Any and all other implied warranties of merchantability or fitness for a particular purpose are hereby disclaimed by RaceFlux. RaceFlux does NOT warranty its fittings for any purpose other than those expressly stated. RaceFlux does NOT and cannot provide a warranty for damages caused, in whole or in part, by the alleged failure of its fittings.